NETWORK FINALS: As it did last week, AMERICA’S GOT TALENT adjusted up 0.1 in final numbers. In addition, both BLACK-ISH reruns lost 0.1. CABLE HIGHLIGHTS: ESPN’s Celtics/Lakers documentary was divided into a 2-hour segment and a 1-hour, and both were strong, with the 10PM hour at 0.67, and the preceding 2 hours at 0.57. 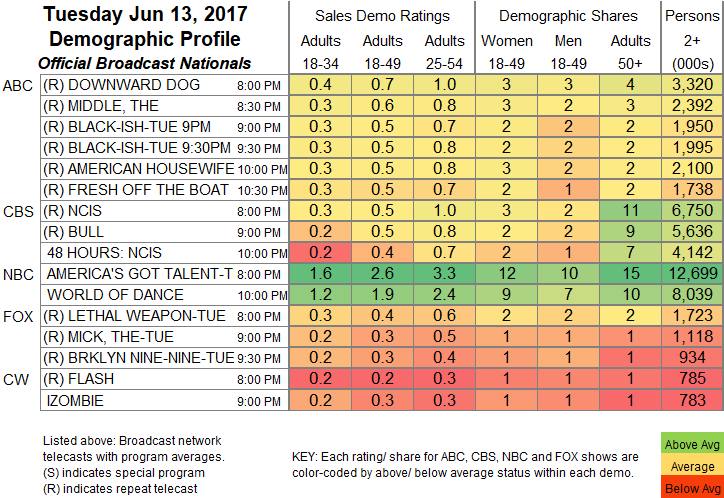 On USA, WWE SMACKDOWN fell 0.11 to 0.63, and TEAM NINJA WARRIOR was down 0.05 to 0.30. History’s FORGED IN FIRE climbed 0.08 to 0.53. Bravo’s BELOW DECK rose 0.08 to 0.50. On Discovery, THE DEADLIEST CATCH slipped 0.02 to 0.48, and DEVIL’S CANYON was down 0.02 to 0.20. On Freeform, PRETTY LITTLE LIARS lost 0.04 to 0.46, and the 2-hour season finale of FAMOUS IN LOVE was at 0.14/0.08, compared to last week’s 0.15 for a single hour. It was another big day for cable news, with 2 networks in the Top 10: CNN’s afternoon LEAD WITH JAKE TAPPER at 0.43/2.6M, and MSNBC’s primetime RACHEL MADDOW SHOW at 0.42/3.1M, while Fox News had HANNITY at 0.32/3.1M. On TLC, LITTLE PEOPLE, BIG WORLD dipped 0.02 to 0.41, and 7 LITTLE JOHNSTONS was down 0.05 to 0.29. Spike’s INK MASTER dropped 0.05 to 0.39, and the REDEMPTION after-show was down 0.05 to 0.19. On MTV, FEAR FACTOR was steady at 0.38, and THE CHALLENGE ticked down to 0.35, with a related PRE-SHOW at 0.16. TNT’s ANIMAL KINGDOM lost a tick to 0.34. On Comedy Central, TOSH.0 fell 0.05 to 0.28, and THE JIM JEFFERIES SHOW was down 0.03 to 0.19. Nickelodeon’s afternoon LOUD HOUSE nicked the Top 20 at 0.32. HGTV’s GOOD BONES gained 0.03 to 0.31. On Food Network, CHOPPED ticked up to 0.29, and CHOPPED JR was down 0.03 to 0.19. On ID, I AM HOMICIDE shed a tick to 0.26, and 6 DEGREES OF MURDER was also down 0.01 to 0.24. A&E’s BORN THIS WAY rose 0.04 to 0.22. 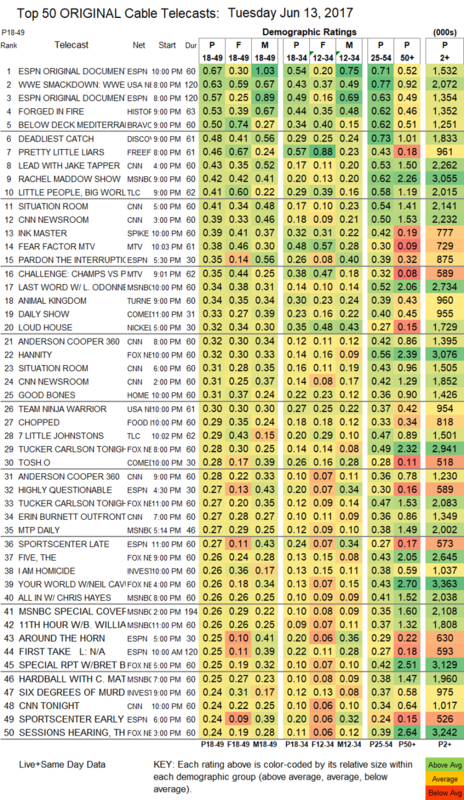 Syfy’s FACE OFF returned at 0.21. A BOTCHED special on E! was at 0.18. NatGeo’s GENIUS gained 0.02 to 0.16. Part 2 of Showtime’s PUTIN INTERVIEWS got even lower at 0.01/80K.